When referring to the immerging field of digital diplomacy, many people place an emphasis on the manner in which social networking sites such as twitter and Facebook have altered the practice of diplomacy. Yet as I recently witnessed, the impact the digital age has had on diplomacy is far more reaching. Two weeks ago I was scheduled to meet a Western Ambassador at a café in Geneva in order to discuss how his mission to the UN could enhance its social media presence. Soon after he arrived, the Ambassador received a text message on his Smartphone. While offering his apologies, the Ambassador quickly read the message and sent a short reply. Then came a barrage of texts messages and for several minutes the Ambassador was inseparable from his Smartphone. For a moment, he looked like a teenager at the dinner table fully immersed in his cell phone to the dismay of his parents. I then learned that the reason for the texting blitz was that a convention was being held in town. The Ambassador, who was not in attendance, was receiving real time information from other Ambassadors who were present in the deliberation room. Far from being insulted, I was fascinated to learn how the Smartphone was revolutionizing the practice of diplomacy. Thus I interviewed the Ambassador on this other facet of digital diplomacy. Through this interview I learned that there were four main areas in which the Smartphone had impacted the practice of day to day diplomacy. The Ambassador told me that the Smartphone has substantially altered the speed at which diplomacy is practiced. Traditionally, trying to get in touch with another Ambassador could take up to half a day. This is due to the fact that Ambassadors often have hectic schedules that include meetings, briefings and (in Geneva) attending multi-lateral deliberations. Yet through the Smartphone, the Ambassador’s peers are much more accessible. This enables the Ambassador to continuously exchange information with his peers. Such information can then be sent by the Ambassador to his Foreign Ministry thereby allowing the Ministry to immediately respond to world events. For example, the Ambassador opposite me was using the information sent to him by his peers in the deliberation room to brief his Ministry. By copying incoming text messages to an email he was able to update his Ministry and, within a few minutes, receive instructions from the Ministry on how to proceed. Following these instruction, the Ambassador contacted his peers in the deliberation room asking them specific questions that were of interest to his ministry. “What I just did in 10 minutes through my Smartphone would have taken me a whole day ten years ago”, said the Ambassador. “Often, I find myself texting another Ambassador while we are both seated in a deliberation room. I ask him what he thinks of the discussion and if he is going to mention my country in his address. He then immediately replies. Once I even asked the chairman of a UN committee for the opportunity to speak through a text! Suddenly, he called out my country’s name and gave me the floor”. Interestingly, the Ambassador stated that people usually take their time before returning a phone call. Yet texts messages warrant immediate attention and thus receive immediate answers. This has “speeded up diplomacy”. Moreover, text messages enable the Ambassador to speak to several of his peers at the same time. “Ten years ago, briefing five foreign Ambassadors would have taken a two days as you would have needed to reach all five of your peers. Now, I can simply text all my peers and converse with them simultaneously”. According to the Ambassador, “There is something very time consuming in a phone conversation between two Ambassadors. Even if you are close colleagues there are certain rules of engagement for such conversations. For instance, each side has to inquire as to the other’s health, activity and family. It takes about ten minutes until you can bring up the issue at hand. Then the conversation also ends with another ten minutes of small talk”. Text messages, on the other hand, are far more direct. “There is no need for niceties in texts and so it is a more efficient means of communication” explained the Ambassador when I asked if there was a difference in the manner he texts or talks to his peers in Geneva. He then added something that surprised me. He said that text messaging actually leads to a more intimate working relationship between peers. This is due to the fact that texts often include slang, short-cuts for long words and even Emoji. “I’m not much of a tech guy but even I find myself using short cuts such as Most-Def or C U soon”. In addition, people often add information that they would not share over the phone such as “stuck at another briefing. Call U 2 morrow” or “Son just landed. Can talk tonight”. Other Ambassadors even use Emoji in their texts. According to the Ambassador, some of his more tech-savvy peers incorporate smiley faces or red angry faces in their messages. These introduce a sort of levity to diplomatic deliberations. “Its a much less formal means of communication” he added. And so it seems that the lack of formality associated with messaging leads to a more intimate form of communication. “These new relations also impact our work. I feel more comfortable asking someone with whom I text for a favor since we are already familiar with one another and have a closer relationship”. Ambassadors have always worked closely with their peers but it seems that the Smartphone has enhanced cooperation at the Ambassador level. As my interviewee told me, “Since we are in closer contact now, and since we are more reachable, I find myself working more often with fellow Ambassadors than in the past”. The Ambassador added that in the “old days” he would have to meet face-to-face with his peers in order to promote collaborations. 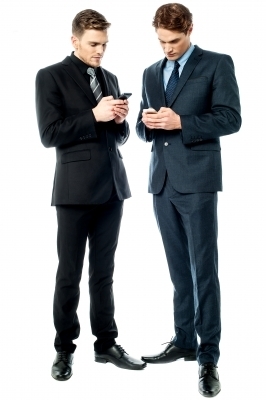 This meant scheduling a private meeting or looking for opportunities to chat at receptions. However, this also meant waiting or days or weeks in order to meet with a peer. “Now I feel like I have the entire diplomatic core at my fingertips” he said. “So if there is an issue I need to discuss I can simply text my colleague. Often I will even text and ask him when is a good time to call? To which he can reply, 6 O’clock at the Mission or 7 at my home number”. The Ambassador then added that greater cooperation at the Ambassadors level makes diplomacy more efficient. “We are both in a position to make important decisions and if need be we can both relay information back to the Ministry and immediately act on instructions we receive. Moreover, as Ambassadors we can discuss issues raised by our peers with the decision makers at our Ministries. This saves hours of emailing back and forth within the Ministry”. Lastly, the Ambassador added that the Smartphone has made it easier to form coalitions with other nations. “We (Ambassadors) can open a working group dedicated to an issue and then we can all text one another and coordinate our actions. At other times, I can forward a message sent to by an African colleague to a European one and say- these guys are also on board! That’s how we can build temporary collations within the UN”. Finally, I was interested in learning if the introduction of the Smartphone has altered the working hours of diplomats. The fact that people are now always on-line has led to a blurring of work hours as we are expected to always be “on call”. “It’s a blessing and a curse” replied the Ambassador in true diplomatic form. “I find myself working at all hours of the day” he said adding “I once visited the US with my family. Before arriving at the West Coast I called ahead to make sure Disneyland was open on holidays. The lady at the other end of the phone laughed and said ‘Sir, this is Disneyland! We are open all day, 7 days a week, 365 days a year’. I think diplomats now live in Disneyland”. Posted in Uncategorized and tagged Digital Diplomacy, diplomacy, Smrtphone, Social media, united nations. Bookmark the permalink.